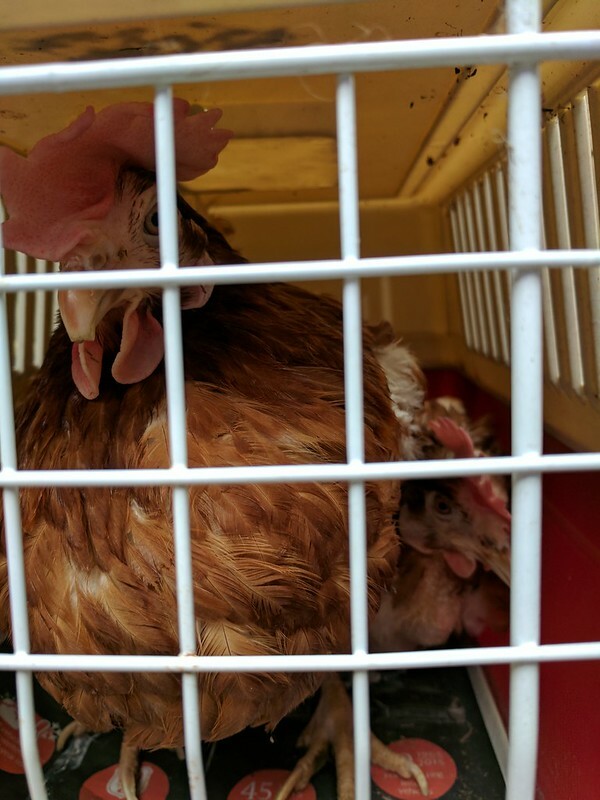 New additions for the hen house – Tallulah and Attila the Hen – who come to me from the British Hen Welfare Trust, who rehome chickens from battery farms when they come to the end of commercial viability. BHWT are very well organised – you sign up online, phone them to have a quick chat, and book into pick up some hens. 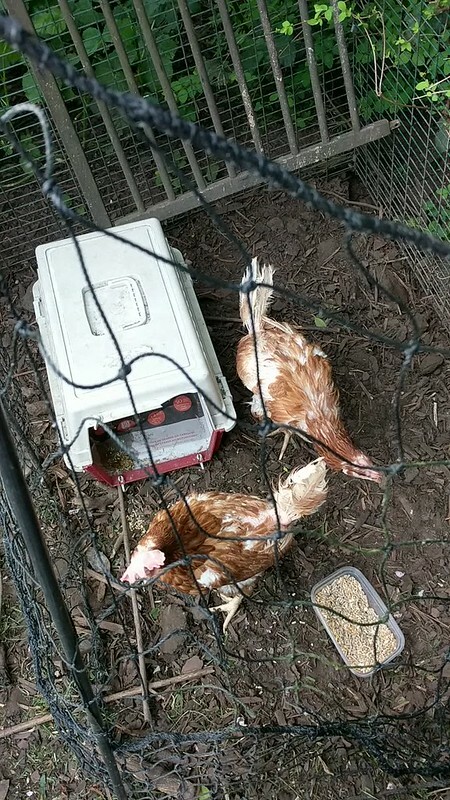 I needed two – the minimum you can have – to add to my existing lone hen, Perry. There’s masses of information on their website and it’s well worth having a read through all of it at an early stage. On the day, pickup was fast and competent. They gave a guideline arrival time by surname within a whole afternoon, had people on the road to tell me where to park and checked my pet carrier was suitable on my way in. They guided me to sign in, sent me around the corner, and I was back in my car with my new birds in… literally under two minutes. The girls are not in best condition. They have a lot of feathers missing and nasty floppy pale combs on top of their head. They are supposed to be red and a lot tighter. They are a heat dissipation method for the birds, and they grow large in their cages where they are kept warm. The feathers are either missing or sparse in large chunks – the birds look almost skeletal! But apparently both the combs and the feathers will start to sort themselves out reasonably quickly and the girls will be almost normal within a few months. I had great plans for segregating the coop and finding ways of keeping the new hens separate. I have a large 2m cubed walk in run, an Eglu Classic hen house and half of an Eglu run which is covered from rain. 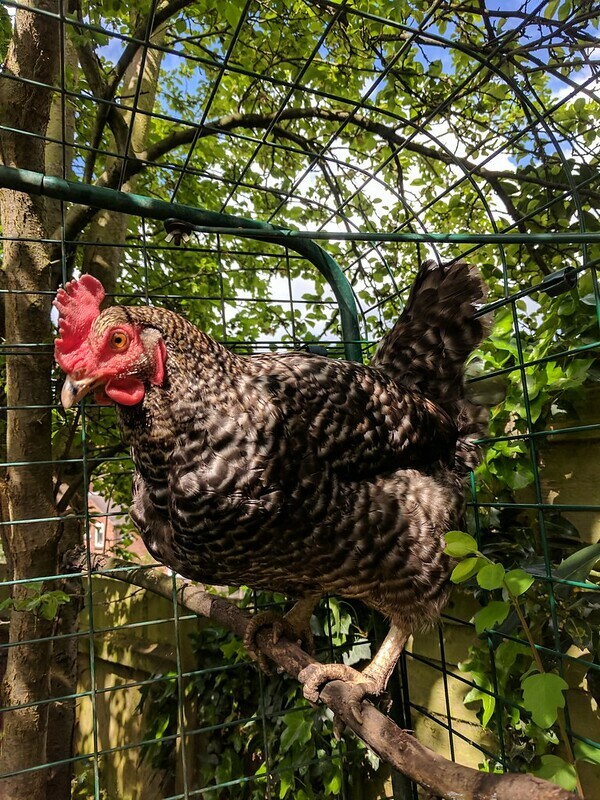 My plan had been to fence off a portion of the run using Omlet fence/netting, and let the new birds live in there for a while, sleeping in the cat carrier they came home in. This plan lasted about an hour. Perry, the existing chicken, at first was just curious at the new girls, but when I went back later, she had managed to tunnel in under the fence but get stuck inside the fenced off area. The new girls were stuck in a corner at the opposite end. So I lifted the fence to let Perry out, secured the bottom of it more with tent pegs, and went away to give them a further bit of time. Interestingly, in their minimally feathered state, you can see their tails move in sync with their throats when they are shouting and crowing. The next hour I went back to find Perry roosting on a perch over the fenced off area – she’d managed to fly over the fence – and one of Tallulah or Attila had flown out of the fenced area to perch on a rod. That was a surprise – I didn’t realise they had enough feathers to be able to fly. At that point I had to give up. The fence was more of a danger than a help! I removed it for bedtime and let the girls get on the best they could. When I went down this morning, the new girls had found the chicken house and were in there. Not sure if cowering or sleeping – but I am pretty certain that Perry was keeping them in there and chasing them back in if they tried to come out and feed. So I’ve had another go at separating them. This time the new girls get the real chicken house and I’ve fenced off the end of the tunnel. Perry gets the entire run and can sleep where she pleases – on a perch or in the cat box. She hasn’t got much rainproofing though. We’ll see how this continues and it will be interesting to see where she lays. Bertha, who joined us in October last, was not long for this world. Two weeks ago, she was clearly unwell – bleeding from her rear end. On closer inspection it seemed she had a prolapsed vent and that Persephone had pecked at it and caused an injury. 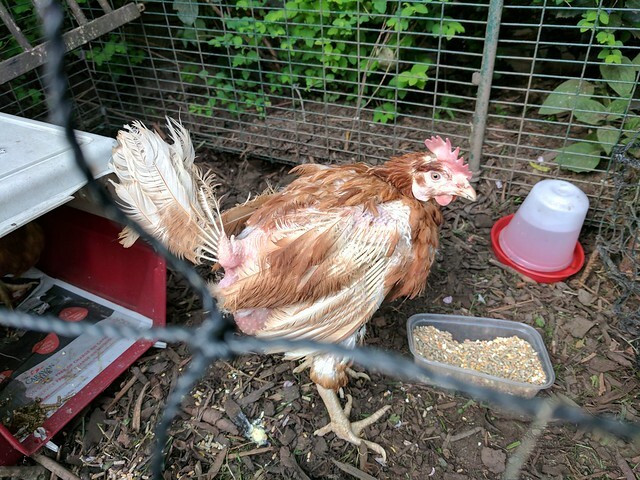 I read up on what you have to do, and that was bathe her to get the blood off and see what was going on, gently push the vent back in and isolate her from the attentions of other chickens. Chickens are cannibals. Who knew? To keep her safe, I cleaned her up and then brought her into the house in a cat carrier we have repurposed for fowl use. She was definitely in a bad way on Saturday night – I put her in the box, closed the door, slightly trapping her tail feathers. She didn’t move for 12 hours. However, the following morning, she was clearly a bit perkier. Opening the conservatory door she cheeped at us, and when we started to feed her again – she’d been starved so she wouldn’t lay another egg and injure her vent again – she went for the food. Thinking she was well on the mend, I put her back in the run. But not a happy outcome – a few mornings later and she was no longer with us. So, a few weeks later and I’ve restocked the coop. This time it’s new season birds, very small, and still a month or maybe two from laying. 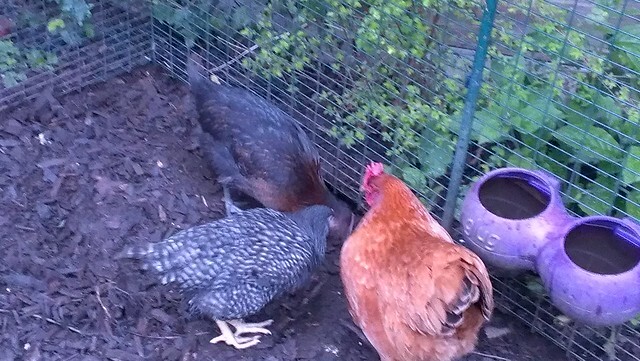 They are a Copperhead Maran and a Barred Rock. The Barred Rock reminds P of a falcon and so is probably going to be called Peregrine. Is there a feminine version? Peregrina? No name yet for the copperhead who, we are promised, will iridesce in the sun. We dropped them into the chicken palace along with some seeds and mealworms and there was vanishingly little squabbling. A little bit of arguing nothing too serious, so I left them to it. Long after dark I went back down the garden to see how it was going. Persephone has now been used to us for so long that when we go down the garden in the middle of the night, she wakes up and comes to see us. For too long over the winter I’ve not been home in daylight and all of the henwrangling has been done after dark. The new birds know nothing of this and were sleeping peacefully in the hen house.